A superb cabinet sized specimen of GEMMY, rich blue Aquamarine Beryl from the Shigar Valley in Pakistan. It features a large and lustrous Aquamarine crystal artfully positioned on a nicely contrasting matrix of snow-white Albite Feldspar. 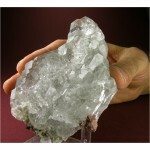 The Aquamarine crystal exhibits a glassy luster and extends all the way through to the bottom of the matrix, as seen in the last photo. There is a tiny, shallow chip on the rear right surface of the crystal as seen in photo #5; this is not at all noticeable unless a backlight is used. All in all, quite brilliant as the photos show. Guaranteed to delight! 6.8 x 4.6 x 3.1 cm.